Why does it even matter that you learn to adapt to change? For one thing, you can’t get away from it. Your life is designed for change. Babies are born and people die. You grow as a child and shrink as you get old. You gain weight, you lose weight. You awaken in a great mood and something happens to change it. People come into your life and they leave. One day passes and another day dawns. Change. It’s how the world works. 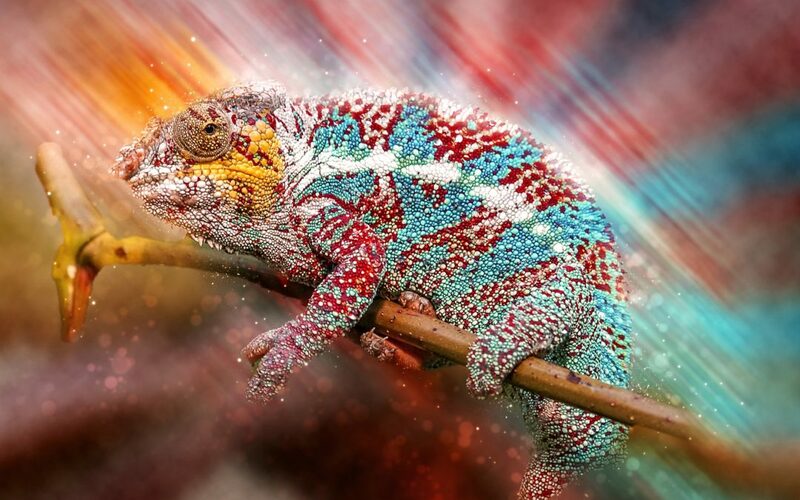 When I think of adapting to change, the chameleon comes to mind. Some species are highly adaptive for a variety of reasons. When they are threatened, some chameleons can change their colors to blend into their environment. If they are feeling aggressive, their colors may become vibrant to ward off their enemy. Some can turn black in the cool of the morning sun to absorb more heat. Later, in the heat of the day, they can turn a light grey to reflect light. They adapt to the changing world around them in an attempt to survive. Although that’s a dramatic example, you may also feel the need to survive when a major life change turns your world upside down. You may feel the need to fight to get yourself back to a new normal. Let’s explore some of the changes that can threaten your sense of harmony and balance? This is obviously not an exhaustive list, but it covers what most might think of as the top ten life events that can knock us down and lay us out for a while. What Can Change Do TO You? Many of us have experienced more than one of these changes—I know I have. With each one, you might feel a wave of emotions, like fear, anger, blame, and grief. You may feel like your sense of security and control are destroyed. Chaos and disorder often follow. There may be discomfort and uncertainty. That is to say—if you allow it. Back to the point earlier about choice. Don’t get me wrong, all those feelings are there to teach you something, so don’t ignore them. Brushing them under the rug will only delay the inevitable. They will come out as huge dust-bunnies at some point and you’ll have to clean them up then. May as well get to the job of dealing with the emotions before you move on to learning the skills that will help you adapt to change. What Can Change Do FOR You? When there is a change in the air, you could embrace it and step into it, because with change comes new opportunities. There is growth when you adapt to change. You can use it to build self-confidence. Make change work for you, so you can build resilience and acceptance because both are remarkably powerful skills to have in your treasure chest. Lastly, you can reframe all that fear, anger, blame and grief into something else. Just because you’ve dealt with those emotions, felt them and released them, doesn’t mean a little bit of that fear doesn’t come back to haunt. Maybe even some of the grief. The doubt and uncertainty, for sure. When it does, you can use your power to choose to think about it differently. Turn it into something else, for instance, a feeling of excitement—for the new opportunities, your growth, and your growing self-confidence. Reframing emotions, that can take you out, is a great way to turn that pit-in-your-stomach feeling into something that will serve you rather than derail you. How Can You Adapt to Change with Dignity and Grace? Why dignity and grace? Doing something with dignity and grace means to me that you do it in a manner that is worthy of honor and respect, and you do it with elegance and good will. Again, you have a choice to stare down change and put your hands out—arms rigid and fully extended—to push it back, or you can open your arms and allow the change to change you for the better. That’s dignity and grace. Think about which way feels better to you. Accept the Change—Let the shock wear off. Don’t duck and take cover. Face it head-on. Allow your emotions to flow through so you can get on the other side of them with more perspective. Choose to be the victor, rather than the victim. Approach the change in a way that allows you to look yourself in the mirror and like what you see. Dignity. Face What Scares You—Whether it is fear, the uncertainty, or you’re just downright angry, don’t allow all that to paralyze you. Talk about your feelings with someone you trust will listen and tell you the truth. Jot down some notes about what you’re feeling, so you gain self-awareness of how it’s affecting you. Writing can bring clarity. Step back and gain perspective about your emotions. What’s the worse thing that can happen? Is it likely? Or, are you blowing it out of proportion? Change How You Look at Things—Perspective is your friend. What if this change was your idea? How would you react then? Not everything is within your control, but some things are—especially your choices about how to react to the change around you. Examine how you’ve behaved in the past when a change has flipped you on your head. What did you do well? What could you have done better? Look for the unexpected gems that come from change. I love what Dr. Wayne Dyer said: When you change the way you look at things, the things you look at change. Build Resilience, Not Resistance—Allow the change to make you stronger, more resilient. Learn from each experience with change, so the next one doesn’t take you down for the count. At least, not for long. Learning from your past strengthens you and allows you to use the strategies again and again. Since life is designed to change, you’ll need that arsenal at the ready. Don’t Be a Lone Wolf—Ask for help. Create a support network around you, what I like to call your Personal Board of Directors. Seek people who have been through what you’re going through. Allow them to reveal the truth, share trust, and bring objectivity. Take solace in the fact that you’re not alone. I share these with you because I love it when I learn new strategies to make things easier for me. So I thought these might help you if you struggle with adapting to change in your own life. Having been through a lot of changes myself, and having shared these same strategies with many of my clients, I know they can work to help you adapt to change. I would love to hear your thoughts and, if you use other strategies that work for you as you adapt to change, please share them with me in the comments below.